You’ve heard this one before, it’s just taken different forms. You also hear the term “A true Auburn man.” That term is loosely assigned to virtues like honesty, hardwork and honor. Well, here’s more proof that the term actually means something entirely different. A funny thing happened in Alabama baseball’s SWEEP of the Auburn Tigers in their own Plainsman Park this past weekend. Following Friday/Saturday victories over the favored and #23 ranked Tigers in their own backyard, the Tide arrived to the park on Sunday to find the doors locked. Literally. Reportedly, as is customary for road teams, the Bama staff sought to use the Tigers batting facilities to ready themselves for the Sunday finale to the weekend series, but the facilities were locked. When Tide coaches complained to Auburn head coach Sunny Golloway, they were met with a flurry of words you’d never say in front of your mother…and on Mother’s Day of all days. Bama ripped the Tigers’ hearts out with a late inning 4-2 win in game one on Friday night, which featured back-to-back homeruns to secure the win. This was followed by a dramatic 7-6 win on Saturday afternoon. So when Bama went for the sweep on Sunday, Golloway apparently had other ideas in mind. And this after Saturday’s game, where Bama first-baseman Chance Vincent had to be taken from the field on a stretcher by ambulance following a scary collision with a teammate. No, Coach Golloway’s plan was very different. Was it instead to show extremely poor sportsmanship, denying his opponent access to adequate facilities so they’d be ill-prepared for the game? Sound familiar? Sadly, we’ve seen this kind of strange occurence on the plains before. Last fall, knotted at 21-apiece with Arkansas, the Hog coaching staff was mysteriously unable to join their team at halftime because the pressbox elevator “got stuck”. In 2009, on the eve of the Iron Bowl, internet chatter began circulating about a possible staged accident to delay the Crimson Tide from arriving at Jordan-Hare Stadium on time. Sure enough, the next day it happened, delaying the Bama buses from arriving to the stadium by almost an hour. Last fall I talked to a former Bama player who echoed thoughts on playing in Auburn. From his experiences, he was suspicious. Petty stuff like no hot water in the dressing room and other annoyances seemed to be the norm when playing there. So with this latest offering of pettiness, is Coach Golloway a true “Auburn man?” Yes, it appears that he is. What a true Auburn man APPEARS to be is someone who knows they can’t compete on a level playing field, so instead of reaching down and working harder than their opponent, they employ lazy, petty gimmicks to try and find an edge. You know, things like running an offense in football built on trickeration, Tom Foolery, and snapping the ball before the officials are in place. Or hiring a basketball coach the NCAA had to ban for a period of time because he was a pronounced cheater. Or the same organization having to change recruiting rules so that a father can never shop his son “without his son’s knowledge” ever again. This story is just another in a long line of stories that prove that it is ANYTHING but great to be an Auburn Tiger. The fact is, everything on that cow pasture continues to stink. 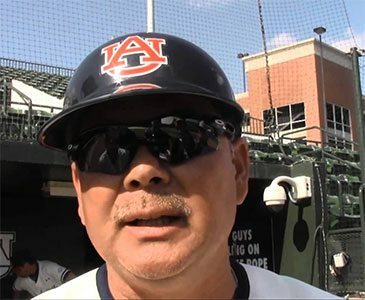 That is, except for the 14-4 drubbing the Tide later handed Golloway in thanks for his gesture, completing the sweep of Auburn in Lee County…their first in 32 years. Weegle, Coach Golloway. Better get the ole resume ready. 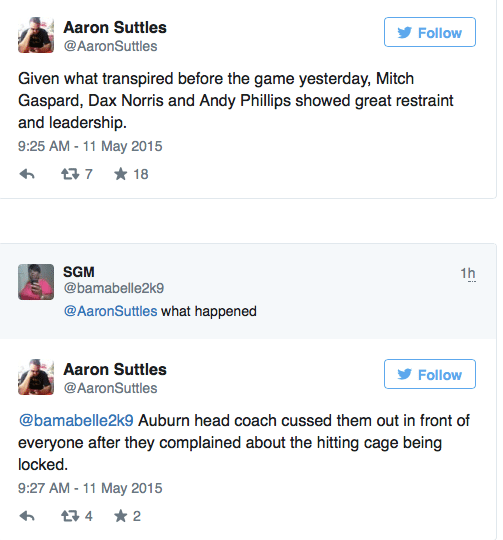 The Auburinites you answer to don’t like getting their rear ends handed to them by big brother. Separator image Posted in Alabama Sports, Commentary, IntheKnow's columns and tagged with Aaron Suttles, Alabama baseball, Alabama head coach Mitch Gaspard, Auburn baseball, Auburn Man, Sunny Golloway, The Tuscaloosa News. This Auburn fan, and i can speak for many many others, when I say that This was a bad hire from day one. This is case and point. Well, we poke a lot of fun at Auburn here, most of it tongue-in-cheek. It’s a fun rivalry, and for the most part, a clean one. But bogus stuff like this is just childish and stupid. It just calls into question a man’s judgment (and possibly character) when he acts in this manner. Even if it were Nick Saban, it’d be wrong. If it were nick Saban I would give him a pass too! In all seriousness it was a bad hire he has a major attitude problem. And it’s an embarrassment to auburn fans. On his behalf I apologize!! Guys is a jerk!! Yeah. True that. I even noticed that guy that used to call Finebaum (Bobby from Homewood) skewered Golloway for doing that. I’ll say the Auburn fans have been rightly critical of him for the most part for this action because they recognize that he is a douche. I expected they would jump to his defense but they haven’t. Can’t stand the AUBS.. Hate that they share the same state with the Alabama Crimison TIde! Like Coach Moore said there are many Tigers, and Bears, but only one Crimison Tide! Win or loose with class. Galloway is a prick. So is Saban I don’t like either. Auburn grad and I will be glad when Sunny is gone and no matter how many BCS titles he has glad Auburn doesn’t have Saban. That said the last post here is rich. Alabama fans lecturing on class when they have the Rammer Jammer Cheer and twist Dixieland Delight with obscenities directed at Auburn. @JohnSmith: That’s fans, not the coaching staff. You won’t find a member of the coaching staff, from girl’s badminton on up, that will pull a stunt like this and keep their job. I think the Rammer Jammer cheer is juvenile and shows a lack of class, but mostly because it has the attitude of “not having been there before”, and I’d like to see it go away, but it doesn’t compare to what is being discussed here. You sound like you’re whining to Mommy’ for help in your post, cause all those bad ol’ fans of Bammer are taunting you with their mean cheers. Ever been hit by a piss balloon at LSU? Or by a beer can at UGA? How about a fire hose at Jordan-Hare? ITK’s post was pointing out things done BY THE COACHING STAFF to influence the outcome of the game. That’s not just cheating, that’s low class trash doing what they do best – trying to win off the field. So, is he OK with the Aubies singing the same cheer (with worse lyrics) when they beat Bama? Big brother??? Who are you kidding? Look to UAB and UAH for brethren if you need them. When it comes to ua and Auburn University, NO RELATIONS WHATSOEVER!!! I’m happy keeping it that way! Dude, aubie is a state college. And aubie is the little snot-nosed poopy-pants brother to another state school, THE University of Alabama. So go take a bath sport, cause you smell. You smell…bad. Anyone calling Bama out for lack of class, need not go any further than Cam’s game at Bryant-Denny when the guy playing the pre-game music was fired for “Take the Money and Run” and “Son of a Preacher Man”. Locking the batting cage doors and then cussing the coaches out are low grade even for The Barn. Was there a follow up on this by the SEC? It would seem reasonable to expect one. I heard that the au coaches objected to the black Alabama players using the facilities. They have separate facilities for black at au.